Rainwater. 22x14. Watercolor on paper. Cloudy day, North Ridge. 14x22. Watercolor on paper. NYC morning. 14x22. Watercolor on paper. Red Flag, Myrtle Beach. 14x21. Watercolor on paper. Apollo Bunder, Mumbai. 11x21. Watercolor on paper. Raleigh Downtown on a rainy day. 21x14. Watercolor on paper. Evening at Joyner Park. 14x21. Watercolor on paper. Secret Creek Autumn. 14x21. Watercolor on paper. Bend in the road. 14x21. Watercolor on paper. House by the railroad. 14x21. Watercolor on paper. Raleigh Downtown in Winter. 21x14. Watercolor on paper. After the rain - NC State Capitol. 16x20. Watercolor on paper. After Chardin. Hare with Powder Flask and Game Bag. Watercolor and Gouache on paper. 17x14. St. Patrick's Day parade in Charlotte. 14x11. Watercolor on paper. New Bern morning. 11x21. Watercolor on paper. Children. 14x21. Watercolor on paper. Road to Asheville. 10.5x14.5. Watercolor on paper. Cary Lazy Daze. 18x24. Watercolor. The Goalkeeper. Watercolor on paper. One of the watercolor paintings from the winter. My own backyard. Ian and I had built this snowman. Ian did not like the idea of his snowman melting away. So, I made this picture so he will have good memory of his little friend (I had also taken some photos on my cellphone but I do not know if those photos will survive through phone and computer upgrades!). We built him near Ian's soccer net so I though it will be fun to paint him as a goalkeeper! If you follow my work (I hope you do! ), you probably know that I do many paintings and sketches of Ian. I also paint things from his little world. He is six now and I have been painting him since he was a baby. It has been amazing to watch him grow. And as he has grown, so has my art. I use variety of watercolor papers. This one is painted on Arches 140 lb CP paper. I used tiny bit of gouache to paint the soccer net. At the size of 11x14, this was a quick painting. The Angry Bird. Drybrush watercolor on paper. Lately I have been enjoying creating drybrush watercolor paintings. I find this technique suitable for some of my subjects. Like this house crow of Mumbai. You find crows everywhere in India. When I was a kid, crows seemed big and menacing. Welcome on certain occasions when we offered food to our ancestors. We would throw food on the roof and these creatures were certain to arrive in packs! We could hear their sharp claws and beaks on the roof. Crows were aggressive and uninvited guests when certain food items were left out to dry. And of course, you always find them around piles of garbage. Sometimes fighting with stray cats or dogs over dead rats. Their crowing was nuisance at the siesta time or in the early mornings. But, at other times, it was considered announcement for visitors! This crow was outside the window of our kitchen in Mumbai. I saw it when I was in Mumbai visiting my family in 2012. I recently made this painting back in my studio. It is a 12x16 drybrush on Arches 300 lb CP watercolor paper. I paint drybrush over both rough and smooth surfaces- both produce different results. Myrtle beach evening. Gouache on paper. I have painted the Myrtle Beach in watercolor before, but this is my first Myrtle Beach painting in Gouache. I love Myrtle beach, so no wonder I love painting it! Couple of years ago, I had made several plein air paintings when I was there (imagine painting watercolors on the beach, few feet away from the splashing waves!). I have sold many of those. This painting was done in studio. I wanted to capture the evening light on those clouds, so, I decided to use gouache. I sometimes use gouache to add little accents to my watercolors. And I also create complete paintings in gouache. Although some artists compare gouache to both oils and watercolors, my experience is different. I also know many purists frown upon using gouache in watercolor paintings. But, all of my favorite artists used gouache: Winslow Homer, Singer Sargent, Andrew Wyeth, Turner, Thomas Moran and the list goes on! I used off-white paper for this painting. Not the smooth kind that is normally recommended for gouache paintings. The challenge for me when painting in gouache is that, unlike watercolors I lose my drawing quickly and unlike oils, it is harder to “draw” with the paint. So, for me patience is the key when painting in gouache. If you like my paintings, please know that I also sell prints and licenses. On the Edge. Watercolor painting on paper. Watercolor painting of Durant nature park. I was there painting yesterday and finished a 22x30 plein air watercolor. This painting was done in the studio. I saw this deer one day. Limping along the edge of woods. I love this park. Very quiet. I see new things to paint whenever I visit (it is not very far from where I live). 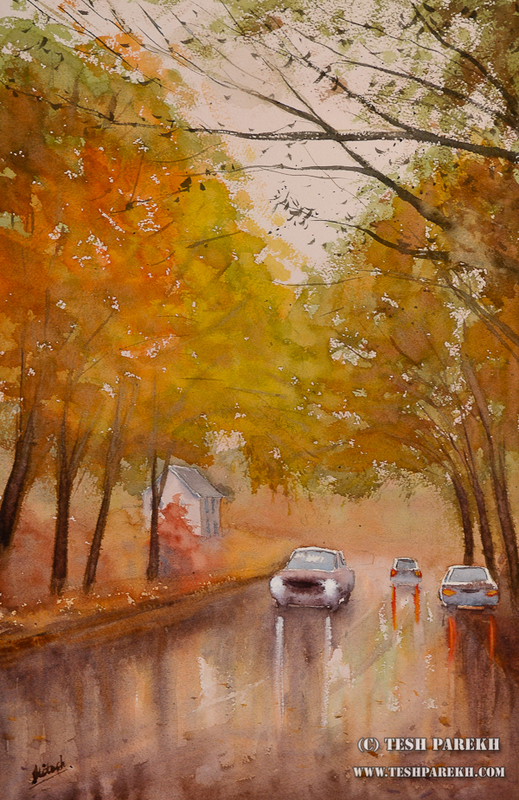 Seasons provide me inspirations for painting the same subjects differently. Everything is lush green at this time of the year. I see deers many times when I am there. I used 300 lb watercolor paper for this painting. I use this paper sometimes for plein air work too. There is a benefit of using the same materials for every painting- you can concentrate entirely on the subject. But, my experience is that this limits the subjects I paint and techniques I use to convey stories. Watercolor painting allows me to work quickly when working en plein air. And when working in the studio, I can slowly paint some of my subjects. I can do dry brushing, for example. And using different papers, paints and brushes help me. I have been painting more than before and having a good time doing so! New for me this year is going to be painting on larger scale more often. I paint half sheets when painting on location and paint half or full sheet when in studio. I will be painting full sheet watercolors on location. What I like about painting on this scale on location is that, it allows me to learn the brush work. Studio work on any scale can be slower and I can get bogged down in details and in creating finished work. Work done on location is different. I have limited time to capture what I am after. So, I have to work quickly and find ways to paint details using visual language. I use bigger brushes when painting this way. I have also pared down my setup so I can carry everything when I am wandering around the woods. While I have always wanted to paint on bigger scale en plein air, I was more enthused by my recent trip to the Brandywine River museum. Andrew Wyeth has always been my hero and this was the first time when I got to see his watercolors in person. I was amazed at the scale of his paintings- both egg tempera and watercolors. I also got to see some of the paintings that I have never seen online or in printed media before. I am also a fan of N.C. Wyeth and other artists of his era and so enjoyed looking at those paintings as well. I really loved works of Howard Pyle, William T. Richards and Dean Cornwell (one painting- badly crackled but beautiful). I did not get to see some the Andrew Wyeth drybrush paintings which I have always wanted to see. But, that may be a good reason to visit there again! Little Sledder. Watercolor painting on paper. Charlotte Snow. Watercolor painting on paper. “Oval Ground, Mumbai”. Watercolor on paper. 14×21. “Weathered Mumbai Wall”. 12×9. Watercolor on paper. “The Lord Ganesha Immersion Procession”. 9×12. Watercolor on paper. “The Lord Ganesha Immersion Night”. 9×12. Watercolor on paper. “The Gardner”. 9×12. Watercolor on paper. "Mumbai Street Scene”. 12×9. Watercolor on paper. Boats at the Gateway of India. Watercolor painting on the paper. Gateway Of India. Watercolor painting on paper. I love the challenge of painting with watercolors! You learn something new with every watercolor painting! I always carry my watercolor paints & brushes with me and love painting en plein air (on location) when I travel. I paint some of the subjects using drybrush watercolor technique. I learned to paint in watercolors and gouache during my childhood. When painting in watercolors, drawing is very important to me. And to get better at watercolors, I also practice drawing. As you will see from my portfolio, I paint variety of subjects in watercolors. With watercolors, I can capture that fleeting moment. And I can also spend days working on a drybrush painting, building layers of paint with tiny brush strokes.